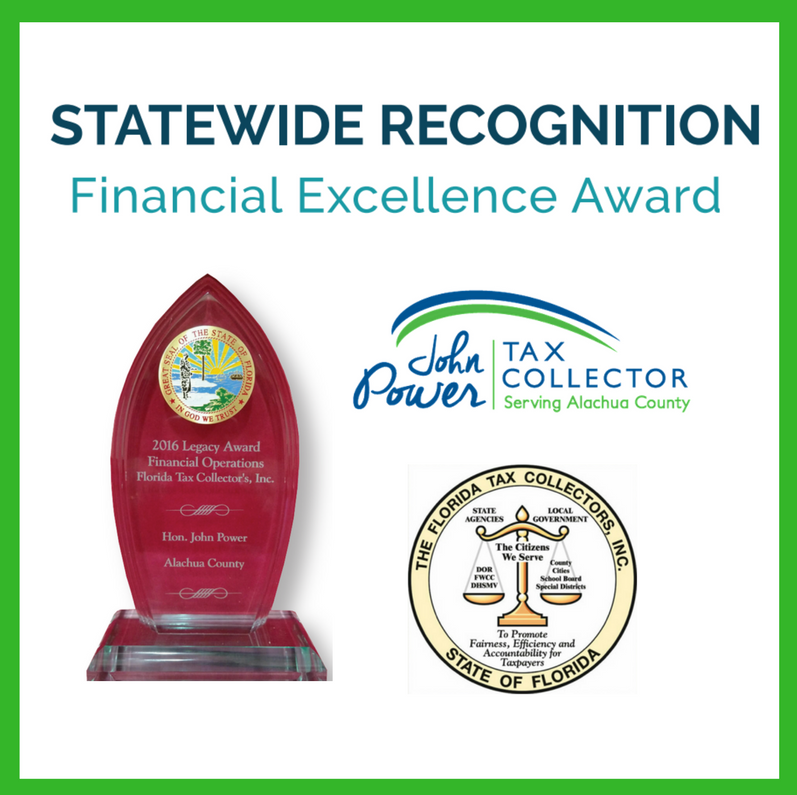 Tallahassee, FL – John Power, Tax Collector for Alachua County, has earned a special designation for excellence in the field of financial operations. The Tax Collector’s financial records, practices and use of technology are rigorously reviewed by a judging panel in consideration for this honor. A five person judging panel made up of government financial executives from throughout Florida examined the Tax Collector’s processes as related to the following four areas of competency: Innovation & Automation; a Perfect Annual Audit Report; Customer Focus; and Budgeting. Previously, Mr. Power earned the Excellence in Financial Operations Award after exhibiting proficiency in these four areas of expertise. However, for the 2016 Legacy Award, Mr. Power demonstrated that his office had further enhanced its financial operations. Tax Collectors carry out State of Florida work at the local level on behalf of Florida’s citizens including property tax collections and enforcement; drivers’ licenses and motor vehicle services; hunting and fishing licenses; birth certificates, and so much more.